Iraq's Christians endure oppression on both sides of the ISIS battlefront. 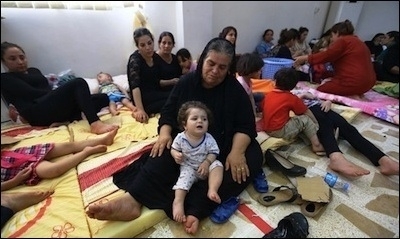 According to Nineveh Provincial Council member Anwar Mata, "more than 120 thousand Christians [were] displaced from Mosul and Nineveh" after ISIS took control of Mosul. "[A]bout 20 thousand of them have migrated Iraq since last year.... The lack of interest of the federal government towards the displaced Christians pushed them to migrate outside the country ... the psychological and moral damage was greater than the loss of their money and property as a result of ISIS occupation of Mosul." Meanwhile, the loss of Christian property was conducted not only by "ISIS," but also by local politicians in Iraq. Impostors and fraudulent groups, thanks to corrupt officials, have managed to acquire illegal possession of thousands of houses belonging to Christian families in Baghdad, who fled the city after the U.S-led ousting of Saddam Hussein uncorked a virulent jihad on them. Mohammed al-Rubai, member of the city council of Baghdad, said that almost 70 percent of Christian houses in Baghdad have been expropriated illegally, and property titles were forged with the tampering of land registers carried out thanks to the connivance of dishonest bureaucrats. The NGO "Baghdad Beituna" has calculated that the violations of Christian properties carried out with the complicity of corrupt public officials were about seven thousand. Even members of the political and military apparatus have enjoyed the "legalized" theft of Christian properties.